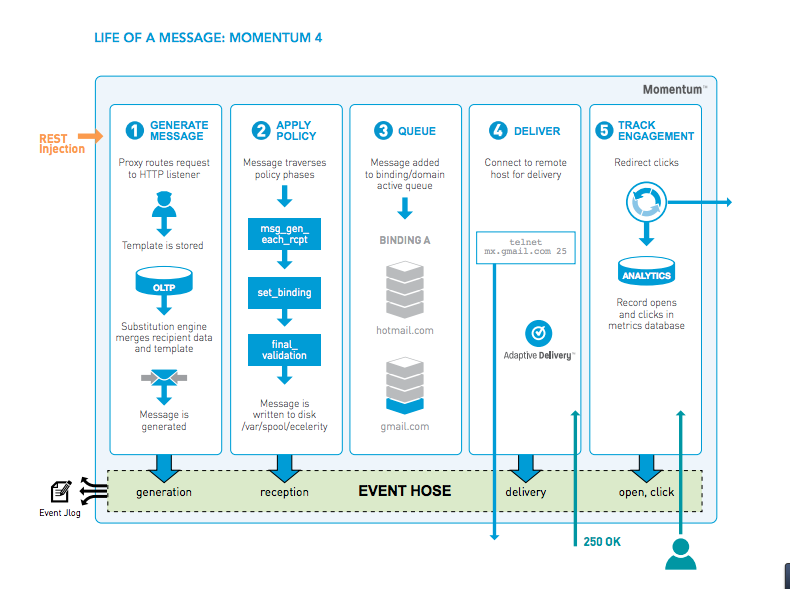 The release of Momentum 4 back in June was something of a watershed for Message Systems. The Momentum platform had existed for 10 years as pure email delivery platform. Those of us responsible for telling the Message Systems story usually avoid the term message transfer agent (MTA) to describe Momentum, because it had long offered capabilities – including automated delivery optimization and data management features – not found in open source and commercial MTA productions. Still MTA functionality is a key part of what Momentum provides. Those deliverability features are still key to the platform, but Momentum 4 now provides capabilities for stages in the messaging process both pre-sending, and post-sending. For Message Systems customers and email industry professionals eager to learn more about Momentum 4 and what it offers, product manager Amie Durr has helpfully put together a detailed white paper. Amie was the executive in charge of the Momentum 4 development effort, and is one of our most knowledgeable executive on the new product. The white paper walks through how Momentum 4 helps senders improve engagement by moving message generation capabilities from separate business intelligence, CRM or CMS platforms into the sending platform itself. Momentum 4’s native message generation capabilities provide for better performance and on-time delivery of email and mobile campaigns. Additionally, a completely redesigned user interface in Momentum 4 provides real-time access to rich messaging and customer engagement data for deep analytics. These capabilities provide marketers and email delivery professionals with real-time access to critical messaging and engagement data. This reduces the expense and costly delays associated with delivery problems and performance issues that can result in blacklisting, hours poring through log files, and the need for direct outreach to ISPs for resolution. Users can easily discern the success of their campaigns, export data for analysis, and take immediate action instead of waiting for reports from providers that may not arrive until days later. With the release of Momentum 4.0, Message Systems is keeping its edge as the top-tier platform for enterprise-class senders. The analytical and data integration capabilities in the new platform will help email senders become more effective than ever before in creating compelling campaigns, reaching the inbox and engaging customers. Learn more about Momentum 4 in our detailed white paper: A New Architecture For Today’s Complex Messaging Needs. Automated deliverability optimization? Momentum’s Adaptive Delivery® can help you with that. Learn more in this white paper!